SPOKANE (Scrap Monster): A citizens advisory committee is recommending that Flagstaff City Council consider a five-year phased approach to the city’s plastic bag problem. with bag fees to be charged if reduction targets are not being met voluntarily. The volunteer committee presented their findings to interim City Manager Jeff Meilbeck Thursday afternoon. The group agreed that plastic shopping bags should be reduced by the end of five years, but not to what extent and what benchmarks to set along the way. It would leave those numbers up to the staff or City Council. Once a percentage goal for bag reduction has been agreed on at various check-in points, staff would create an outreach campaign to educate the public and businesses on how the new ordinance will work. The committee also recommended that any business that gives out plastic bags should also have a bag recycling drop-off box in its store. The bags are not recyclable locally but can be delivered to an industrial shredding plant in Phoenix and ultimately made into a wood-plastic particle board. The committee also recommended that businesses be required to keep track of the number of plastic bags they had on hand and how many they gave out. The second phase of the program would involve implementing the education program that encourages less bag use, installing the bag recycling drop-off boxes and ramping up the bag reporting system. If the city was not meeting its goals for progressively reducing the use of plastic bags through education, then the committee recommended imposing a fee for the plastic bags. Depending on the size of the fee, this has been shown in other cities to cause shoppers to switch to bringing their own reusable bags. If the goals are met voluntarily, then the panel suggested either a fee or a ban to help lock in the targets. Shoppers would not be inconvenienced, they said, because the majority would already not be using plastic bags. The choice between a fee or a ban would be based on a survey of businesses preferences. Even if goals are being met voluntarily and no fees or a ban are implemented, the committee suggested that the city continue to keep an eye on the program and impose a bag fee if the use of plastic bags started to increase in the future. The committee members had several long discussions about how the city should measure progress and what goals should be set. The system the committee finally decided on was suggested by committee member Stuart McDaniel, who is the government affairs director for the Flagstaff Chamber of Commerce. The system would require businesses to keep track of how many plastic bags they ordered and then gave out and report that to the city. The city would then measure the decline of the use of the bags as a percentage. The city would also measure the percentage of bags that were being dropped off to be recycled. The committee couldn’t come up with a target percentage goal for either measurement in the short time frame it was given and decided to leave that up to the city to determine. McDaniel also suggested banning all types of plastic bags, including dry cleaning and bulk produce bags. The committee discussed the idea, but settled on point-of-sale plastic bags only. McDaniel also recommended focusing a section of the education process on elementary school students. It’s easier to change the habits of younger residents than adults, he said. The city could do competitions between classrooms to see which class could collect the most bags. The winner would get a prize. The committee suggested that that be added to the education program. 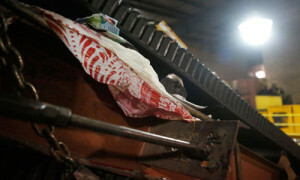 He also pushed for the city to do more to look into finding ways to recycle the bags at the city’s recycling center. Rick Resnick from the Sierra Club suggested a series of phased goals where if the city didn’t meet its goals through education that it would move on to a stricter method of reducing the number of bags used. The committee incorporated his suggestion into its three/four-phase approach. Moran Henn, from Friends of Flagstaff’s Future, recommended that the whole process take place within three years. The committee eventually recommended that the city reach its bag reduction goals within less than five years.